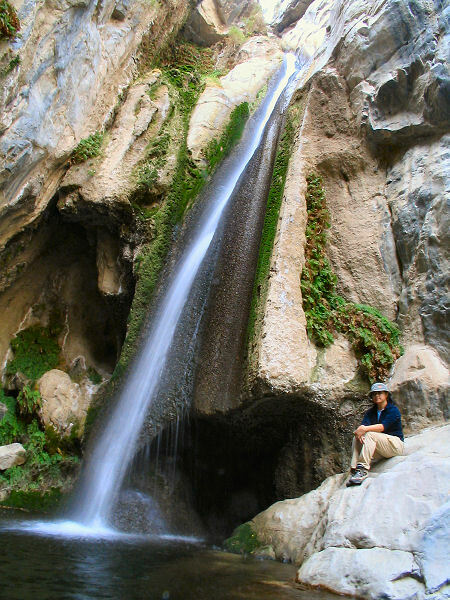 Summary: A short hike to a very scenic waterfall and grotto in the middle of the driest place in North America. 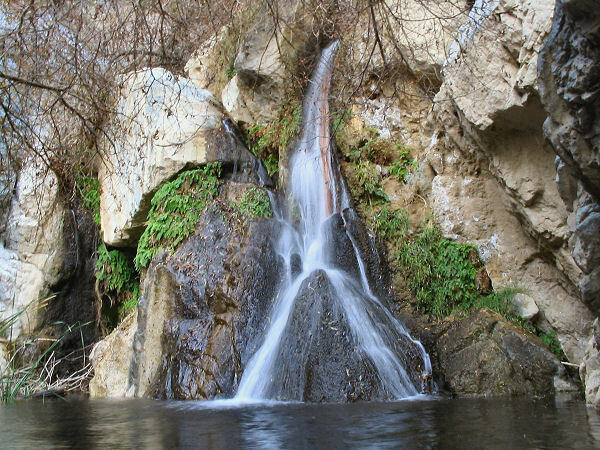 The falls is located just west of Panamint Springs. Directions: From Panamint Springs, drive west on CA 190 for about a mile. Turn left (south) on the signed dirt road for Darwin Falls and drive 2.5 miles to the parking area and steel gate on the right. Hike Description: From the parking area, walk past the steel gate into the dry wash and begin hiking up canyon next to an ugly PVC pipe which has been jury rigged to the right side of the canyon with rope, rocks and other lengths of pipe. After about 5 minutes of walking you'll reach another steel fence and a sign for 'Darwin Falls - Area of Critical Environmental Concern'. Water soon begins to flow in the canyon bottom and you'll have to jump the stream a few times in order to keep your feet dry (careful, the mud is slippery). Before long you'll enter a lush, verdant canyon and the first falls, which is a complete let down. Have no fear. Route find around the first falls along a well used path on the left (facing up canyon), then back down into the drainage on the upper side of the falls. 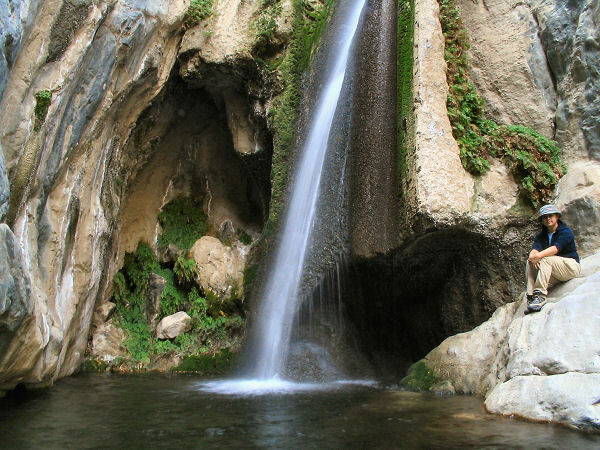 A 100 yards later, after passing through an overgrown stretch of trail, you'll reach a scenic grotto with 3 sets of falls (though you'll only be able to see the lower two). 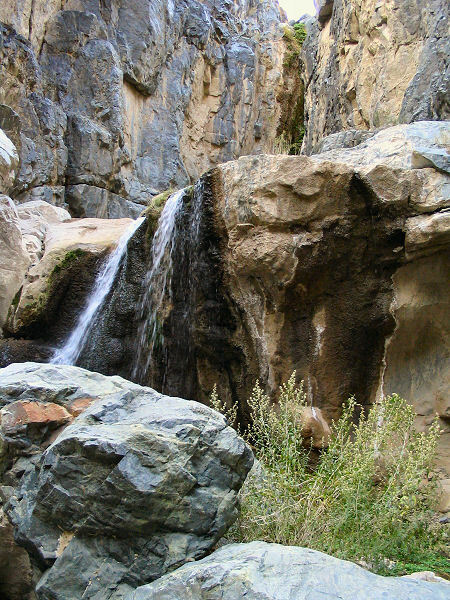 To reach the upper falls, and the best part of the canyon, climb a scree slope on the right (facing up canyon) and look for a path which leads left to the top of the second falls. With some careful climbing on the right you can reach the upper falls, which cascade down a lovely 50 foot chute into a fern lined pool. It is possible to continue up the scree slope to explore further up canyon, but I did not find anything of interest past these falls. When ready, return the way you came. The author and his wife explored up to the falls and beyond and back in 2.5 hours. Lower falls. Scenic grotto and falls. The upper falls. A different angle.